Detumescence Therapy and the Hair Loss Theory Behind It: Real or Fake? This, he says, causes swelling in the scalp which then thickens and hardens into a dome shape. 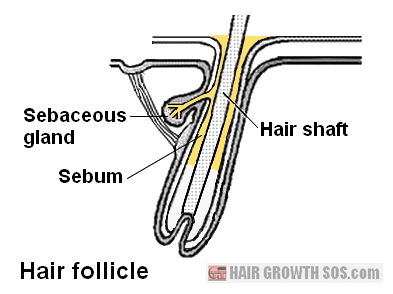 Tensile and compressive stresses then develop within the dome causing hair loss to develop. 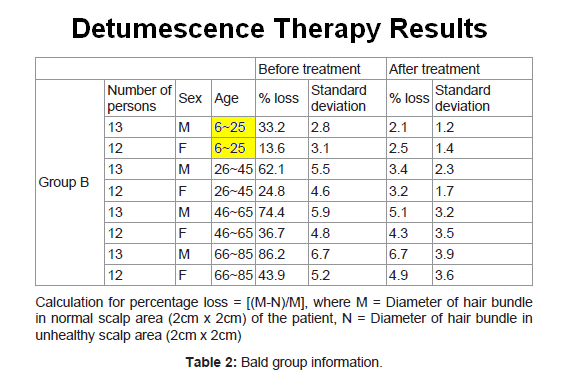 Choy's article also suggests that "detumescence therapy" can reverse this scalp swelling, and claims that observations showed "over 90% hair recovery" in all 100 people in a baldness study group. Now, if all that sounds a bit hard to believe... you're not the only one! So I decided to take a good long look at Mr Choy's "Detumescence Therapy of Human Scalp for Natural Hair Regrowth" article. And, as you'll see below, it's completely riddled with holes! Problem #1 - A LACK of Androgens Does NOT Causes Hair loss! Choy's article states: "A lack of androgens may cause the hair follicle to get progressively smaller and the hairs to become finer in individuals who are genetically predisposed to this type of hair loss." No, the opposite is true. It's well known that high levels of androgens (male hormones) are associated with hair loss, not a lack of them. That's why it's called androgenetic alopecia! However, to be fair, since the author is Chinese, perhaps this first error might simply be due to poor translation. Nevertheless, I would still expect any translation for a medical journal article to have been properly proof read before it gets published! Problem #2 - What Causes Grease to Build Up Inside Hair Follicles? Choy's article suggests that high levels of grease trapped in hair follicles initiates the whole hair loss process. OK, so if that's the case, what causes the high sebum levels in the first place? And what would cause all this sebum to develop only in those who suffer hair loss? Unfortunately, his article doesn't even raise these questions, let alone answer them. The closest I think he gets to addressing this issue is by providing some background information which mentions "androgens" a few times and "dihydrotestosterone" (DHT) once. I think the androgen DHT is relevant to his theory. That's because sebum production is directly influenced by DHT. The higher DHT levels are, the more sebum gets produced. And high DHT levels have definitely been linked to hair loss. The only other thing I could think of that might give Choy's theory for hair loss some credibility (i.e., regarding sebum) is that he uses the term "swelling of scalp skin". To me, that suggests inflammation. And hair follicle inflammation has indeed been associated with hair loss. So it is just possible that high levels of sebum could cause the inflammation (i.e., swelling) that's been observed in hair loss patients. But, like I said, Choy didn't put any of this in his article. I think he should have addressed this very important point. Finally, since Choy believes that sebum trapped in hair follicles is the root cause of hair loss, I'm surprised he didn't discuss personal hygiene (e.g., hair washing with Nizoral shampoo to remove sebum and reduce scalp inflammation) perhaps alongside detumescence therapy. You can learn about Nizoral shampoo and how sebum, inflammation and hair loss can all be connected by reading my Nizoral shampoo review. Problem #3 - Scalp Thickening and Hardening Do NOT Cause Alopecia Areata! Choy's article states: "This paper suggests the change of scalp thickness and softness is the root cause for the hair loss or baldhead problem appeared in male androgenetic alopecia, female pattern hair loss and alopecia areata." No, it's well known that alopecia areata is an auto-immune disease. It's not caused by any of the reasons he suggests, and it's also completely unrelated to androgenetic alopecia. If Choy really wants to know what causes alopecia areata (and its related conditions), he should read: alopecia areata. Problem #4 - One of Choy's References Contradicts His Hair Loss Theory! 2) in advanced baldness, all skin layers except the galea exhibit definite thinning." "In initial MPA [male pattern alopecia], no statistically significant variations in scalp layers were observed. In advanced MPA, a definite decrease in the values of epidermis, dermis and hypodermis brought the thickness of each layer significantly lower than those in normal subjects... 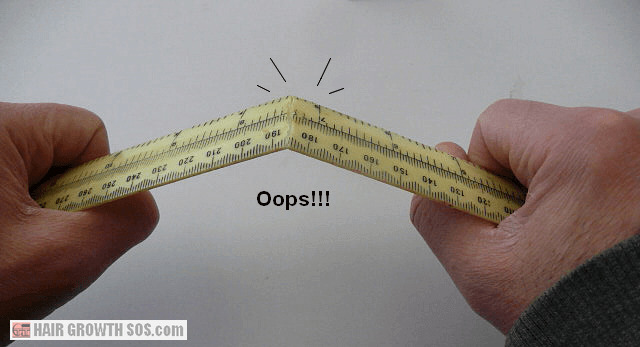 The galea capitis did not reveal any change in thickness." OK, so if hair loss is caused by the scalp getting thicker as Choy suggests, then why is it that this earlier study states that the scalp does not get any thicker when hair loss has just started? And in advanced baldness, all scalp layers actually get thinner (apart from the galea which remains unchanged)? Clearly, the 1972 study contradicts Choy's hair loss theory. Which begs the question: Why did Choy use this study as one of his references? Problem #5 - Scalp Skin Does NOT Grow 24mm Thick! Choy's "Results and Discussion" section states that in test group subjects with the most severe hair loss: "the skin (scalp) is thick (18 mm - 24 mm) and hard". Quite simply, I do not believe that the hair loss process involves skin on the human scalp growing up to 24 mm thick! Instead, I believe the 1972 study (referred to above) which states that, as hair loss progresses, the scalp tissues actually start getting thinner, not thicker. Problem #6 - We Don't All Have A Flat Skull Shape!!! In his Materials and Methods section, Choy states that daily detumescence therapy transformed scalps from hard and thick to soft and thin, and that the head shape: "changed from domed (swelling) to flat (close to skull bone shape)". Also, his Results and Discussion section states: "the head shape is completely flattened into a straight line (i.e. close to the real skull bone shape)." This implies that everyone has a flat skull shape, and that any head shape which deviates from this (i.e., a more domed/rounded head shape) is all due to swelling of the scalp. However, the skull expansion theory recognizes that a domed shaped head is entirely due to the underlying skull bone structure and its growth. Scalp tissue swelling has nothing to do with it. Skull shape is a genetically inherited characteristic. So that's the main reason why head shape can vary from person to person. 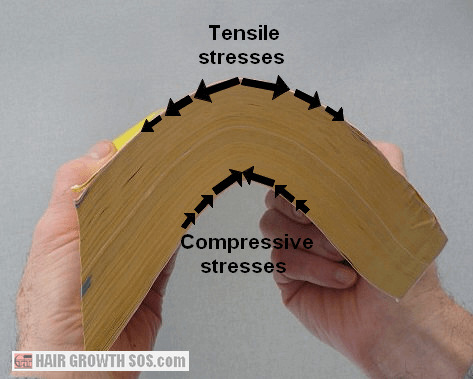 In his Results and Discussion section, Choy refers to Figure 3 which illustrates tensile and compressive stresses when bending a phone book. Bizarrely, he then uses this to illustrate his claim that hair loss is caused by scalp thickening. He states: "The root cause for hair loss on scalp can be explained by the analogy concept that the greatest tensile and compressive stresses occur on the outer covers of a phone book during bending". I think this statement must mean that Choy believes the scalp tissue thickens into a domed shape and, as it does so, the scalp bends generating tensile and compressive stresses which then cause hair loss. First, from the arrows in the image above, you can see that the position of greatest opposing tensile stresses during bending is at the most extreme point of curvature (i.e., at the very top). If you then apply all this to hair loss, it means that the greatest tensile and compressive stresses will also be at the most extreme point of curvature, i.e., at the very top of the head. And that would mean the greatest extent of hair loss should also be at the top of the head. 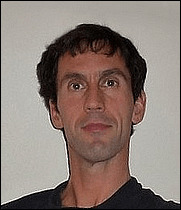 But, in the photo below, you can clearly see that thick strong hair can still grow at the very top of the head at the position of maximum curvature. So how does Choy's theory explain that? Furthermore, from the photo you can see another area of strong hair growth at the front. I call this "remnant hair". According to Choy's theory, this area must have thin skin to keep the hair growing well, which is then surrounded by thick skin in the area of baldness immediately behind it, and then the skin gets thin again in that area of strong hair growth at the top! Surely that doesn't make sense? How can there be just a narrow band of thick skin stretching across the width of the head? Note: "remnant hair" is one of several characteristics of androgenetic alopecia that other hair loss theories (including Choy's theory from his Detumescence Therapy article) can't explain. If you want to know why remnant hair continues to grow, just read: Why does the "pattern" in male pattern baldness develop? Problem #8 - Were 6 Year Old Children Really Used In The Study? In the "Results and Discussion" section, Table 2 (copied below) gives data on 100 people before and after they were treated with detumescence therapy. And it clearly shows that 25 of these (13 males and 12 females) were aged between 6 and 25. Although Table 2 does not give individual ages, presumably there must have been at least some children involved in this treatment regime (otherwise he would have stated a different age range, not "6-25"). So that begs the question: why would someone perform detumescence therapy (i.e., hair regrowth exercises) on tiny children? Were they actually suffering from hair loss? If so, what type? Androgenetic alopecia usually starts no earlier than puberty. Is Choy claiming that 6 year old children in Hong Kong suffer from male pattern baldness? Surely not! Perhaps then, they suffered from alopecia areata? Choy believes that scalp thickening causes both androgenetic alopecia and alopecia areata (as mentioned in Problem #3 above). But, surprisingly, his article doesn't even state which type(s) of hair loss the study participants suffered from. He only states that the people involved were "selected by random" and that they were a "sample representative of the general population". OK, alopecia areata affects just one or two people per thousand (that's 0.1% to 0.2% of the general population). So that suggests it highly unlikely that anyone in this study of just 100 people would have suffered from alopecia areata. Statistically speaking, this is a minor issue because only a small proportion of children could possibly have taken part in the study (Table 2 above shows that there were 100 participants in total, but only twenty five were aged 6-25). 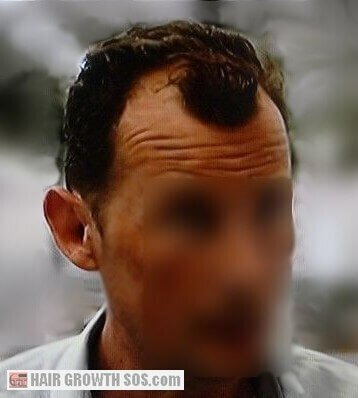 Nevertheless, this was a study into hair loss, so why on earth did he include 6 year old kids?!!! 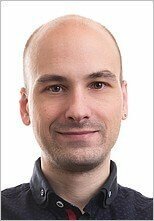 Problem #9 - Was This Article Written For Google Ranking? It might sound cynical, but I get a very strong feeling that Choy's journal article might have been search engine optimized (SEO'd). In other words, it might have been written in an attempt to rank high at Google, Bing, etc for a certain keyword phrase (probably "natural hair regrowth" which appears in the abstract of the article three times and the article itself a further three times). Of course, I hope I'm wrong. It's all well and good writing web pages that have been SEO'd. If they're not, no one will ever find or read them! But journal articles are all about science, and bringing your work to the attention of the scientific community. Is Choy's Hair Loss Theory and Detumescence Therapy Just One Big Con? Well, it seems to me that there are way too many holes in Choy's hair loss theory for it to be a real scientific study. As for the detumescence therapy, it's basically scalp massage. And that's something I do believe can definitely help hair grow. However, not all scalp massage exercises are the same. My own methods, for example, include three massage-related techniques which target specific regions of the scalp to improve scalp flexibility and hair growth. If you read "Here Today, Hair Tomorrow" you'll see what I mean. However, since there are so many problems with Choy's hair loss theory, this must also raise serious doubt about the authenticity of the amazing hair regrowth results achieved from the detumescence therapy (massage exercises) that his article reports. How Does Choy's Theory Compare With Skull Expansion? Choy's article was brought to my attention by a number of people who emailed me after they saw some similarities between his theory and my own (skull expansion). 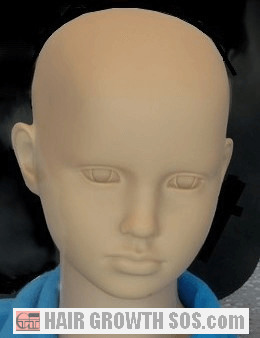 Both theories refer to the "domed" shape which often coincides with severe hair loss development, and the "flat" shape which often appears in those who never develop hair loss. When I read Choy's article, I saw the similarities. In fact, it looks almost as though he could have taken my own work (which was published many years ago and then later appeared in an article I wrote for the Medical Hypotheses journal in 2009), and adapted it to come up with some pseudo-version of his own! So, given the similarity, I find it interesting that he did not include my paper amongst the 19 references his article cites. I can only assume he was unaware of my work. Which is strange because, normally when you conduct new scientific research, it makes sense to see what's already out there. That way, for example, you don't make a total fool of yourself if you realize later on that your theory is complete and utter rubbish! It's also customary to give proper citation to any study from which your own is derived. So, again, I can only assume that his work was done completely independently without any prior knowledge of my own research into the correlation that exists between skull shape, skull growth and hair loss. If he had read my research, then he would have realized that it's skull bone growth that causes the domed shape, not excessive scalp skin growth which somehow gets driven by an excess of trapped sebum. What are your own thoughts about Choy's theory for hair loss and his detumescence therapy? By all means use the Comments section below to let me know. "When my friend told me about this remedy I laughed because it sounded ridiculous. However, I took a look at the ebook and I must say that the information backing up your techniques is astounding."